Be warned: This easy gluten free appetizer by our bestie Kirsti Tichenor, Swoon Society blog coauthor, is so outrageously delicious, you’ll want to hoard every last morsel. Skip the cheese and it’s dairy-free. Regardless, prepare it once and it’ll become your party-starting staple—that’s a promise. The garlic’s cooking time depends on clove size, so keep an eye on them to get soft, but not dark, garlic. In a skillet over very low heat, add the olive oil and garlic cloves and cook until soft but still light in color (overcooking will ruin the flavor of the garlic and the oil), 30 to 40 minutes. Add the cherry tomatoes and cook, stirring occasionally so they don’t burn, 20 minutes longer. Remove from the heat, add 3 of the sundried tomatoes, and let cool to warm. Chop the remaining sun-dried tomatoes. While the garlic-oil mixture is still warm, pour it into a rimmed platter, add the chopped sun-dried tomatoes, capers, and pepper to taste. 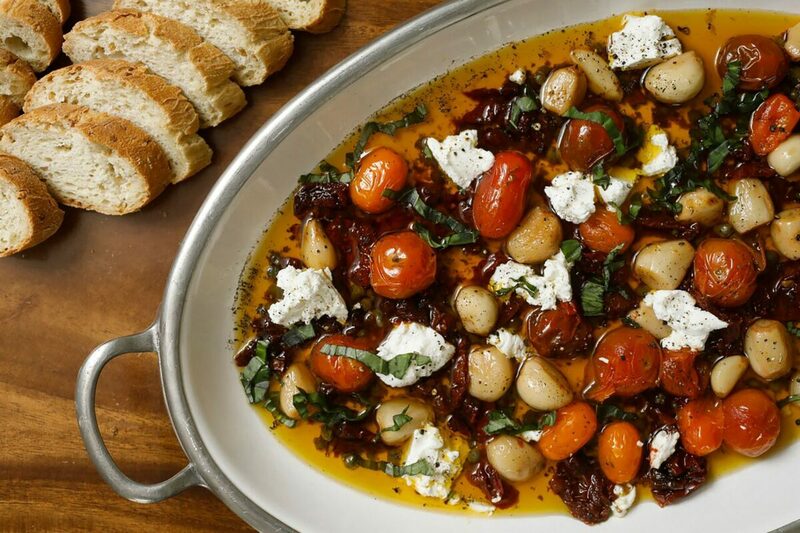 Crumble the goat cheese into the platter, add the basil, and serve with the warm bread.